Chenab bridge in Jammu and Kashmir is in news now days for future highest bridge of World. Chenab Bridge is an under-construction rail bridge, located between Bakkal and Kauri in the Reasi district of Jammu and Kashmir (J&K), India. The 1,315m-long bridge is being built at a height of 359m. 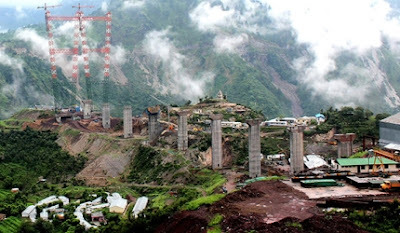 Once completed, it will be the tallest rail bridge in the world. The arch-shaped bridge across Chenab river-bed in Reasi district, which will be five times the height of Qutab Minar at 359 m above river bed, will connect Baramulla and Srinagar to Jammu via Udhampur-Katra-Qazigund covering the entire route in about seven hours. The ambitious project, which fell victim to various issues such as its alignment, feasibility and also security concerns, is finally beginning to take shape with the construction of pillars on either side. The 1,315-m-long engineering marvel would boast of several unique features. The design would ensure that it withstands blast and seismic activities, while the signalling arrangements would ensure the train does not encounter high wind velocity at that height. racist - they're just profiting from the racially inequitable system.